I use it on everything I mail… to tape up my packages, or to tape the back of an envelope with a cute piece of fabric. I use it on home-made cards and gift tags. It’s a fun way to decorate clothespins! 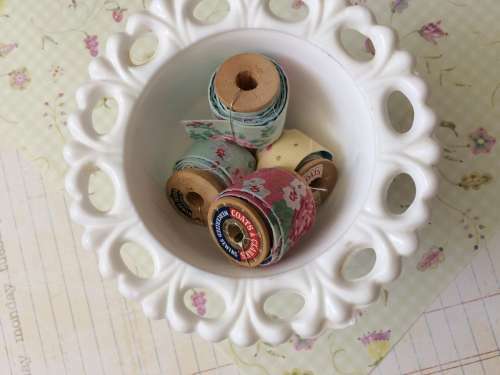 You can take long strips of the fabric tape and wrap it on a vintage spool. Tie it in place with a tiny jewelry wire and you’ve got your own spool of tape! 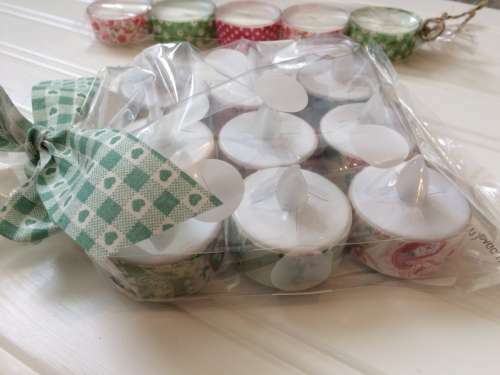 Placing fabric tape on tea lights and placing them in a clear plastic bag is a great gift idea! Cute little bags of fabric tape all by itself is just so delightful. Are you seeing all the possibilities now?!! Start with some fabric scraps at least 1.5 inches wide and however long you’d like. I made these about 5 inches long. You’ll also need some doubled sided Duck Tape, which you can find at Walmart. You can use scissors if you’d like, but I prefer a ruler and a rotary cutter. Cut your tape the length of your fabric strips. Place the tape on the back of the fabric strips. Then turn the strips over and make sure there are no wrinkles in the fabric and just really press so that the tape adheres completely. You’ll want to clean up the edges of the fabric so that it is exactly the size of the tape. This is where a rotary cutter comes in handy. You will also want to cut your tape in half width-wise so that it is approximately 3/4 inch wide. This is a nice size to work with. 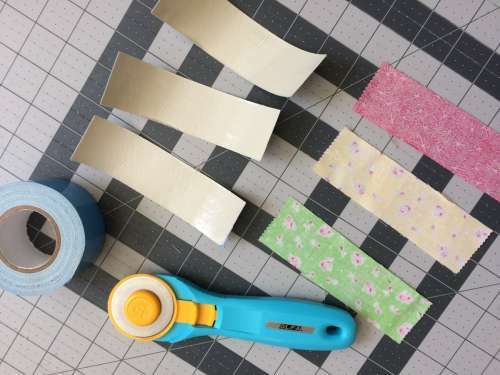 You will now have some cute strips of fabric tape! When you are ready to use it, all you have to do is remove the blue film on the back and you’ve got perfect fabric tape! 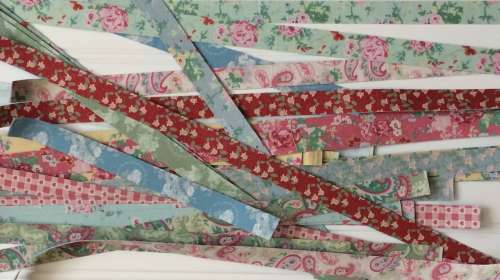 You can also make long strips of fabric tape if you’d like. Sometimes they come in handy! So now! The GIVEAWAY you’ve been waiting for! Please leave a comment below with an idea of what you think you might use fabric tape for! 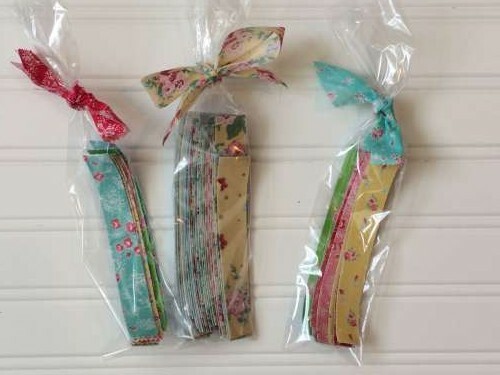 I will pick TWO lucky winners in May to receive a happy little package of my homemade fabric tape! Very pretty, love those clothes pins! I am going to try this on the top edge of clay flower pots! Wow Dori, you have certainly inspired me! How about sticking a lovely piece to your dog, or if your cat wears one, collar. Might as well dress up fidos leash while you’re at it. Could work for the show ring on livestock halters, too. What a cute and easy idea. I would use it on a plain white shirt and change it out each time I wore it so I’d always have a different look. How Cute and it looks like this tape will be as much fun to make as it will be to use it!!! It would be an interesting collage if you used the tape to hold done bits of lace and old photos etc… in a random method!!! Each collage would take on a different look depending on the fabric you choose to make the fabric tape with! That is such a wonderful idea. I send a lot of packages and I think that would be so cute! I love a personal touch! I can think of many ways to use the fabric in my little. Intake caper , Mary Jane. Thanks for the opportunity!! I would love to use them on my many clothespins. Yours look so attractive and I could make mine look that way too. Thanks for all your wonderful ideas. I think this is the cutest idea. I have this giant clothes pin, the strips would be perfect for. You could also put different edges on them and put them on doll skirts. like rick rack etc. Thank you so much for sharing. I love this . I would use the fabric tape to decorate the tops and bottoms of letters to my 88-year old Mom. She lives only 2 hours away but she LOVES receiving letters from me. 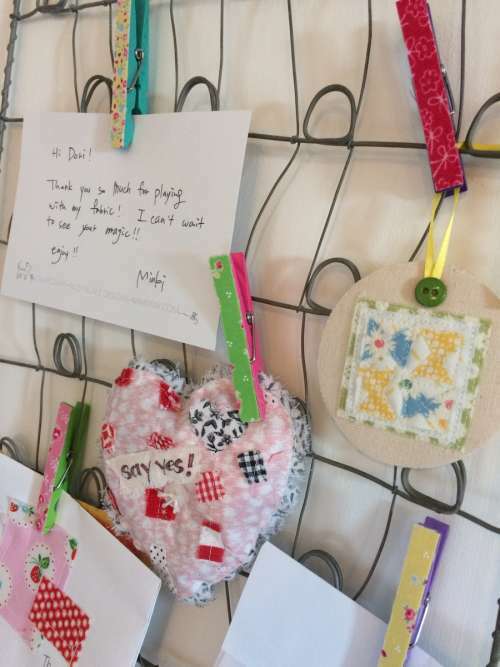 I always include news clippings about quilting or other things she’s enjoys … as well as any recent photographs I have taken that she might like. The fabric tape would add an old-fashioned look to the letters that I know Mom would love. Great ideas here, Dori! What a FANTASTIC idea! I am going to have fun with this. I also make homemade soaps and this will be a great way to dress up the packaging and kept closed! What a fun idea! I think I’ll plan a crafting session with my grandkids and we can make up some fun tapes to wrap gifts in. They can each make several tape sets to bag up and take home for future use. what a great idea! I love it. I would never had known this great craft if it wasn’t for your site. I am always looking for new ways to use up a lot of my fabric scraps. I would love to be more creative. You are a true blessing to all of us who read your site. I see some really cute bookmarks, especially if they match a pair of pajama pants! Cute idea. Thanks! Super cute idea! Love it, great instructions. I work with special needs children and would love to try a project using the fabric tape. I think the kids would be much inclined to create images or words with something colorful but easy.What a great idea! Great idea, and simple enough for even kids to do. (With some help with the rotary cutter, of course). I think a strip added to a hang tag/price tag of my quilts for sale would be a perfect finishing touch. A strip across the laundering instruction might also add a nice touch and insure the label is saved. 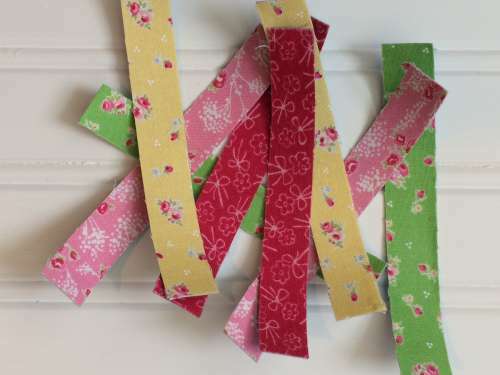 And for scrap booking…real fabric strips to replace washi tape…oh the ideas keep coming. Thank you so much for this inspiring post, as always you deliver! What a great idea to use the smallest of fabric strips. I didn’t know about double sided duct tape. Thank you so much! Have a blessed day. As a quilter, I am always looking for uses for the scraps I collect. Fabric tape is perfect! I would use fabric tape on the special cards I make for friends and family. In addition to embroidered and knitted/crocheted motifs, the addition of fabric tape would make the cards very special. Beautiful! I think it would look beautiful to wrap around taper timer candles. Also, little girls could decorate flip flops! I would use the tape with my Family Childcare children to make Mother’s Day gifts. What a great idea! I like all of your suggestions for using this fun tape, but another idea that comes to mind is using it to decorate my clothespin basket. That is such a great idea, I would use the tape on my old wooden spools of days gone by. I have been trying to think of ways to use and decorate them. You always have such great ideas. I love getting your letters, they are always inspiring. This is a great idea and will be a new addition to scrap-booking that I do for my family genealogy scrapbook. I can add strips to my pages or use them to underline or border a quote or an explanation of a photo. I can also make bookmarks for my reading books. Thanks for the idea. Can’t wait to try it out. 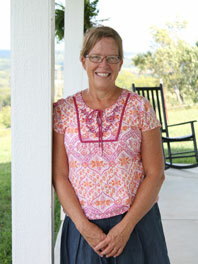 I get so much inspiration from MaryJane’s Farm bloggers and her magazine. Hope it never stops. Oh, I also had another idea; for frayed or worn clothes that I hate to part with and love to wear, I could decorate them with this tape and cover up the worn and frayed parts, and just remove them before laundering. Save my clothes. Amazing idea of fabric tape!!! And what fun to use all the scraps we have left over!! And so fun for grandkids to help!! I love to cook and give away as gifts. These beautiful strips could decorate homemade bread or cookies or anything. What a unique idea to make our items extra special with a new look. Thank you so much for this idea!! Fun! I know a couple of 8 year old grandgirls who will be excited to help with this cute project! 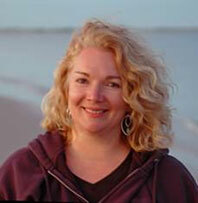 First of all……I love your blog and have been following since you were building your beautiful home. 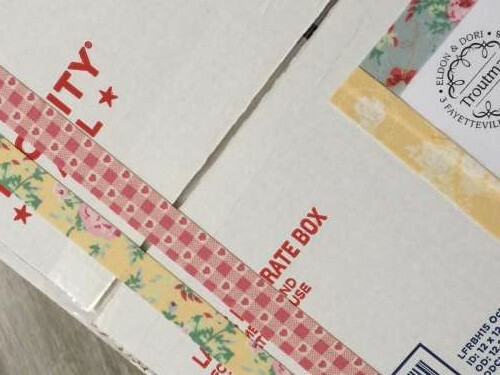 I think this cute tape would be a great way to seal up those college care packages that I plan on sending to my granddaughter when she heads off to college in the fall. This is really a great idea. I might make some with my longer scraps of fabric to add to journal pages in place of the washi tape I use often! I will be checking out the tape isle the next shopping trip I make! Thanks for the clever share! Super cool!!! 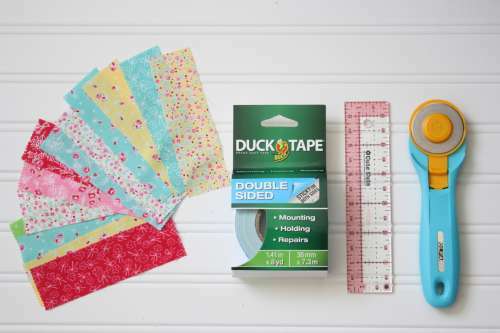 Besides fabric crafting I do paper crafting and use paper tapes, why hadn’t I thought of fabric tape – duh. Well my mind is going wild now, going to Walmart today and get the tape and away I go. I just put some chicken wire in an old picture frame to hang ideas etc. above my sewing machine and now I have the clothespins to do and hang this idea and some fabric tape from it. Oh gee on this cold/WINDY/snow on the ground day, this makes everything look brighter. You are a true inspiration. God bless. 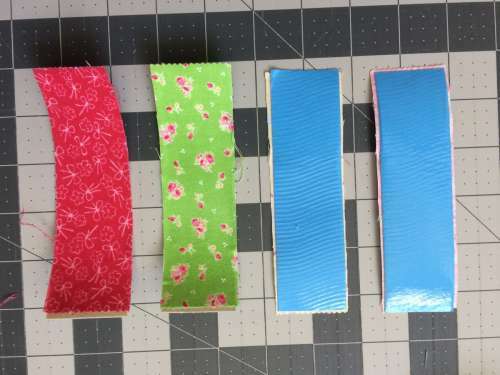 Your beautiful fabric tape “recipe” looks easy. I would use this tape on the back of farmgirl mail I send out. A cute way to decorate the mail. Fabric tape would be great on a project box so you can quickly identify what’s in it. The color fabric will jump out at you better than writing on a label. Thanks for the tutorial. been waiting for your blog this month. Love this idea. 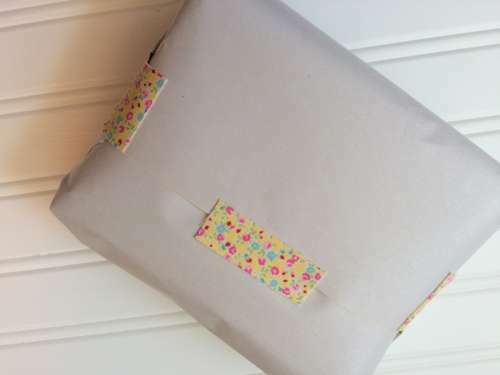 I am not an artist so I could use fabric tape on packages (saving money by buying white wrapping paper), cards, pots, etc. I also can use some shirts to cut up into strips. I am sure I will be sticking them on a lot of things. Thanks for the giveaway. Thank you for that cute idea. I may just try it or maybe I’ll win your giveaway! Either way, I appreciate crafty people with imagination. Keep up the good work! What a cute idea! I love your quick and easy projects. 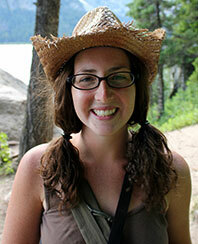 I am doing a Mother’s Day project with clay pots for my daughters and putting my grandkids’ pictures on the pots. I think I will used your fabric tape to accent the borders around the pictures. I am so excited! Thank you. what a clever idea! I make my own cards too so I loved that idea and would try that. I also like the long strips to use on wrapping gifts too. thanks for sharing that with us! Wow I need some, and what a great way to use scraps, and also chic decorating idea. I love this!! So many things come to mind. I would use it to weave a cover on a Journal, wrap around Mason Jars, wrap the hands of my garden tools, or decorate boxes being sent in the mail… and so many more ideas are brewing! Thanks for such a fun idea!! I can’t wait to show this to my granddaughter. THANK YOU! I would use the fabric tape to trim my wallpaper. I love the tea lights! What a great way to use up the smaller pieces of fabric in my stash. What a charming craft idea! I use vintage clothes pins all over my house for a variety of things. 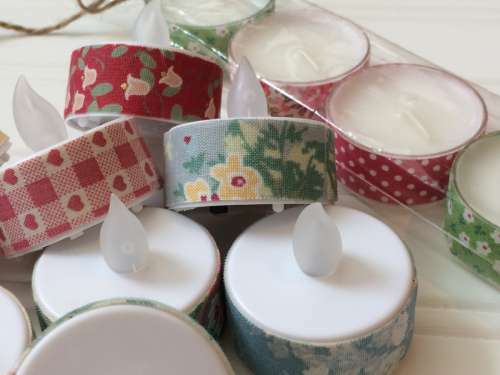 They would look even cuter dressed up in these fabric tapes! Thanks for all of your terrific ideas! What a wonderful idea. Thanks for sharing. I will make some to send to my 4 year old granddaughter. She will love this. Absolutely love this idea! This will be something to use at the Senior Center I volunteer at and a fun project for the Extension Homemaker Club to make and package for our yearly Country Store. I would try dressing up a plain lamp shade with fabric tape! Hi! What a great idea!! My grand girls love to come to MiMi’s herb shed and do craft projects! They like to dress up their notebook pads! I think this would be a fun project for them!!! What fun, I did not know they made double sided duct tape! I would decorate a picture frame. Brilliant! I’ve never heard of double sided duct tape. 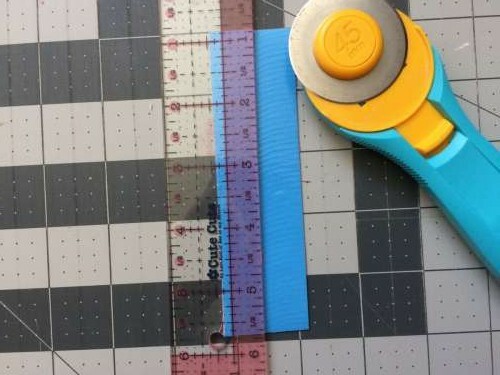 I am a quilter and a paper crafter and this new little trick is something I will definitely add to my tool box. Beautiful fabrics are too dear to waste and of course I have totes of scraps. Thanks for the tip. I usually use heat and bond with fabric, but this way there’s no ironing involved. Easier for kids and for me too! As to how I’d use them… perhaps as seals for my handmade envelopes, either cut into shapes with paper punches or with an exacto; to create mini quilts on greeting cards; to cover little match boxes…. oh what fun. I love reading your posts. Visiting your world through your Mary Jane widow is a joy. 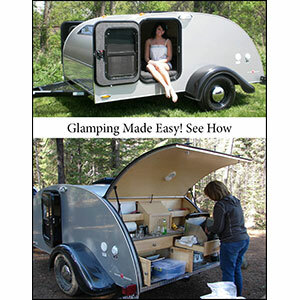 Dori, you have some of the neatest ideas (and fabric, too). I love this one and will use it on many things. As a card maker I have used Scotch double sided tape, but had not heard of Duct brand. I will definitely be looking for it. Thanks a bunch for sharing your many clever ideas with us. 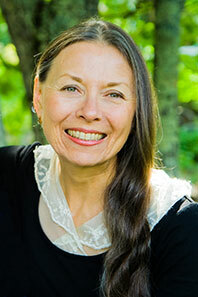 I make a lot of my own lotions, butters and other skin care products using essential oils. These are perfect to decorate the jars for giving as gifts! Thanks so much for sharing! Thanks for the ideas. The clothes pins are my favorite. What a cute idea! I think it’d really be cute on a journal – maybe for my granddaughters or myself! What an amazing idea! Wow, double-sided Duck tape. I love the cards! Thank you so much for sharing. Such a great idea, you are an inspiration. I would use tape to trim bags and buckets for our shell collection during our beach vacation with the grandsons. Thanks ! would be great in coordinating fabric when hanging a small quilt with a clamp style pants hanger. Brilliant use for all those little fabric scraps I couldn’t bear to throw away. Thank you for sharing the tutorial. I can see using the fabric tape on cards and notes to friends. What a clever idea! I think using them on my canning jar gifts would be perfect! What a cute, fun idea. I’ll definitely be trying these. 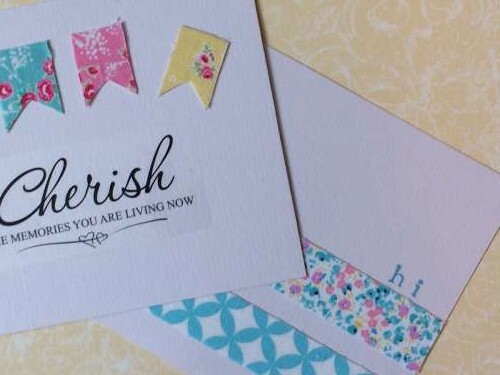 I especially like them on the handmade cards. Love it. Very cute idea. I have a lot of old spools and that will be a good way to add some color to my rv space. You are just so clever! I’m thinking that I’d like to use this idea to add fabric trim to the edges of my lampshade in my sewing room. It is a straight edge, so it wouldn’t “buckle” if it were angled. I could also add it to the edges of a book shelf I have….so many possibilities! Love this idea ! Thanks much for sharing!! This is a great reason to save even more fabric scraps!! A novel idea! Didn’t know about two-sided duct tape. A good way to personalize notebooks and reports for work or school. So many ideas. Love them all. I’m all for decorating things that I use every day to give them personality and individuality. I love all the ideas you’ve shown for these pretty little tape strips. 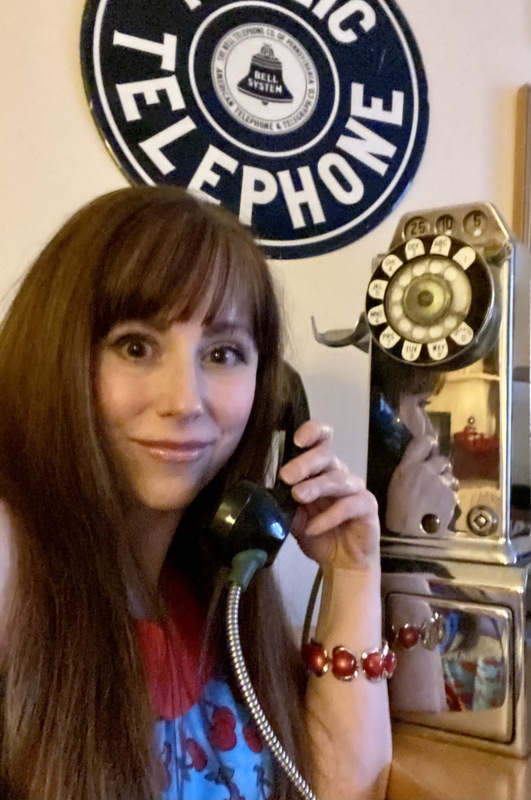 My head is spinning with ways to use it in my photo studio, too! Thank you so much for the instructions who wouldn’t love a treat pkg of these?